Standard is the most popular format in competitive Magic, but it has never really been very popular. Maybe it’s better to say that it is the most ‘populous’ format. Either way, Standard has the de facto largest market share of Magic formats, and is the face of competitive Magic’s brand. I have heard people complain about every Standard format for the last 12+ years- sometimes justified and other times not. As we take our first steps into the Masterpiece Era, it’s important to understand that Standard is going to be the primary factor for pricing on any new1 cards, as well as potentially creating a very distinct life cycle pattern. 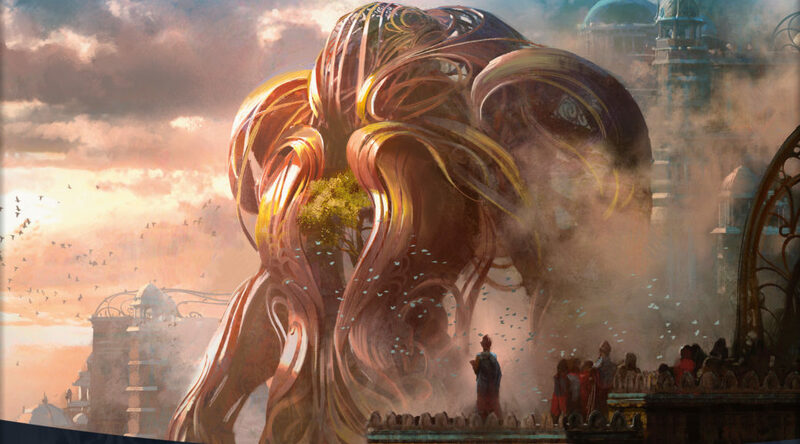 As we review Kaladesh from the perspective of a Standard player, we are going to simultaneously hit on a few key points in this new post-Masterpiece economy. 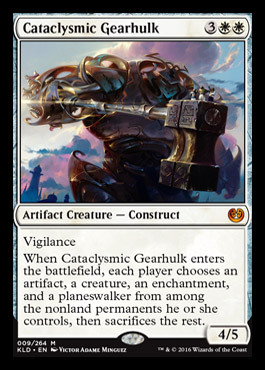 Cataclysmic Gearhulk: I want to go over the Gearhulks individually, because they are being broadcast early on as a pretty significant element in the set. This isn’t a flavor statement, since I’m not sure what their role is there, but as the latest cycle of “titans”, these fill a pretty big role as marquee single-color threats. Despite the longevity of Primeval Titan in other formats, which often overshadows his (?) siblings, its important to remember that all five of the M11 Titans saw action in Standard. The Gearhulks are not as pushed as the Titans as a whole, but they do represent an evolution of the cycle that is understated yet significant. The Titans were all 6/6s for 4CC, whereas the Gearhulks cost EITHER 3CC or 4CC (and each with unique P/Ts). 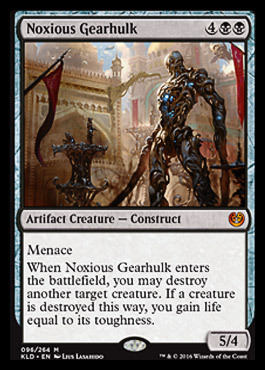 Cataclysmic Gearhulk coming down on turn 5 is significant because it saves you an additional turn against opposing strategies that are trying to go wide with threats. Although this isn’t templated the same as Tragic Arrogance (your opponent can pick which of their cards stay), it’s still an extremely strong effect that comes with a very defensive 4/5 Vigilance. If Kaladesh Standard shakes out to rely heavily on board presence, it’s likely that this is one of the best of the cycle. I don’t think its coincidence that these are all five Masterpieces. Torrential Gearhulk: Okay, so this is probably the worst of the cycle, at least early on. Because Torrential Gearhulk is unable to target sorceries, there are no enticing combinations currently in Standard (the only mythic Instant is Kozilek’s Return, a card that is actually WORSE OFF being cast off of Gearhulk rather than staying in the graveyard). As things currently stand, this is going to very often just re-buy a removal spell and serve as a clean, if underwhelming, tempo play. It’s possible that WotC is holding back on the big splashy options until Gearhulk is closer to rotation, or that it proved too risky and we see all of the game-changing spells as sorceries for the next year and a half. This is going to be objectively better in formats with more high-impact instants, but those formats simultaneously become less forgiving for six mana creatures. Noxious Gearhulk: Like its white counterpart, Noxious Gearhulk is a card that I expect to be better in practice than on paper. In fact, the two represent the varying extremes of threat dimensions, Noxious serving as an answer to a single opposing creature, Cataclysmic excelling against several individually weak creatures. Given that one of the set’s main mechanics (Fabricate) allows players to decide in game how they want their board to develop, it’s possible that these two ultimately work fairly well together. Menace is huge, especially in environments where Noxious Gearhulk is already otherwise a playable card. This is the least impressive of the three so far (and probably of the whole set) outside of Standard, but I don’t know that any of these are going to get serious play anywhere else. Combustible Gearhulk: Just like the blue one, this Gearhulk is better in a combo shell than a traditional midrange battlecruiser strategy. Fortunately, we have the cards to “enable” Combustible in Emrakul, Ulamog, and uh… Emrakul. It’s possible that you will cast this card and LITERALLY win the game. Once. I don’t know that this deck exists outside of the realm of theory, but unless we also get Congregate at Dawn, expect this deck to be… swingy, at best. A strategy that rewards you for playing a critical mass of expensive spells is going to naturally suffer in the early stages of the game, meaning the fast decks can go to town, let you draw 3, and then just attack around the Gearhulk and win, while the control strategies are given sufficient time to find an answer (or just counter your guy). The “best” Combustible Gearhulk deck will have to fundamentally restructure Magic deck-building and theory if it’s going to attain respectable ‘Tier 1’ status. I’ll buy in on this card when the Angels win the pennant. Verdurous Gearhulk: Of the four ACTUAL Gearhulks, this one is likely the worst. That is not to say that this is a bad card. Verdurous Gearhulk has the most flexibility of any card in the cycle, ranging from a 3GG 8/8 Trampler (something that would have taken 1996 by storm), to a 3GG 4/4 that can change combat math in any manner of permutations. If there is a G/x strategy similar to the GW token decks of the recent past, it is very likely that some number of green Gearhulks find their way into the 75. This card is kept in the conversation by virtue of costing  and not . Wears green, spreads it around, has a brother that makes it look bad- Aaron Rodgers Robot? GEARHULK BREAKDOWN: The white and black ones are good, and are probably worth snagging sometime soon if you plan on playing a lot of constructed Magic (despite the usual new set tax). The blue and red ones are not quite ready for prime time, and at $6 each have plenty of room to fall after underwhelming out of the gate. Verdurous Gearhulk is the most situational, but surprisingly the most expensive. I don’t see a clear Day 1 strategy that I like for Greenhulk, so I’ll pass until supply forces a price cut. 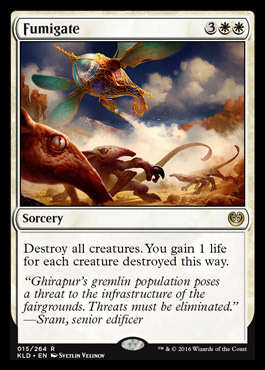 Fumigate: Remember when we talked about Languish and Planar Outburst a few weeks back? Essentially the sentiment was that Planar Outburst was set to be the best Wrath of God effect after the rotation of Languish short of a playable alternative in Kaladesh. Fumigate is most certainly playable. Although Fumigate is priced at , the life gain addition does a good job of partially recouping the life lost from waiting an additional turn. In token-heavy strategies (a phrase I have typed quite a bit so far), this is likely to get you “back” roughly a turn, especially as creature power trends closer to 1. I think this makes a very strong case for control decks to have access to white mana and becomes one of the marquee anti-aggro spells in the format. If threat density becomes an issue for UW/x, I could see some number of Planar Outbursts serving as extra copies of the effect, but I think there are enough ways to win otherwise. At $3, just buy them now if you plan to play them. Fumigate could lead to a Silent Spring for aggro decks. The Kaladesh Fast-Lands: Lumping these together because they are coming into an environment where I expect their play will be very uniform. We are losing the Apocalypse pain lands at a time where enemy-pair strategies are still very popular. I expect most decks just play 3-4 copies of these, most specifically WR (a pair that plays fewer lands on average, but needs lots of double colors) and BG (a slower pair traditionally, but the one with the two most mana-specific colors). Slower colors will max out on creature lands first, but I still think these will be fairly uniform 4x in Standard. The price fluctuations are likely just due to some being “better” in Modern than others. Smuggler’s Copter: This is starting to get some love going into the Prerelease Weekend as possibly the “best” vehicle for constructed. Testing results are still anecdotal at best, and likely to skew towards linear aggro decks, which tend to overperform in the early stages of a format’s life cycle. I’m not as impressed as other people seem to be, but I also think I like Fleetwheel Cruiser more. 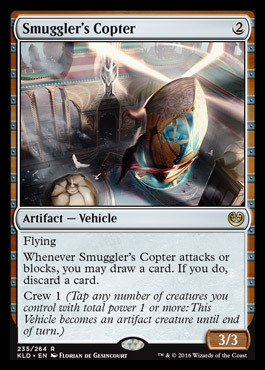 Vehicles are definitely going to take a while to figure out, at least beyond the semi-obvious RW Vehicle aggro deck. The upside here is that if you can otherwise animate a vehicle (Ensoul Artifact is sometimes played in Modern Affinity), you still get the combat abilities. Cool, but possibly not good enough. I’m less impressed than most of you. 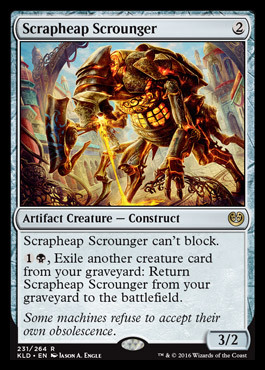 Scrapheap Scrounger: Possibly the best crew member for vehicles outside of RW. Unlike that reckless Wesley Crusher, who got his friends killed by attempting dangerous stunts. He should have been expelled from Starfleet Academy for his unbridled hubris. Is there any surprise that I’m high on this card? Marionette Master: OBEY YOUR MASTER. MASTER. MASTER. MAAAAASTAAAARRRRRR. Midnight Oil: Oil? Phyrexian Oil? PHYREXIANS ATTACKING KALADESH CONFIRMED. Okay, we are firmly off the rails at this point. Come back next week for the rest of the set! 1Not including stuff like Conspiracy or Commander decks or whatever. You know what I mean. Only complaint is that I wish article was longer, but excellent writing. Keep up the good content and I will be staying here for a long time to come. Thanks! Yeah, I ended up splitting my piece in half, and I wanted to save enough for next week. Big percentage of what is remaining is bulk, though. I also think people are sleeping on Fleetwheel Cruiser too much. It’s in one of the Planeswalker decks and that will hurt it’s price a little, but not play-ability. And it’s a creature the turn you cast it so it’s a potentially reusable Ball Lightning. One note about the Fast Lands in Standard I noticed…All the Enemy Color Lands enter TAPPED!! Now the fast lands enter untapped turns 1 and 2 obviously, but with all the midrangy decks and roadblocks like sylvan advocate and reflector mage aggro has suffered. My point is that the more powerful spells cost 4 mana and up, but all the UR, WB, GB, GU, and WR decks will be playing man lands or fast lands tapped as the game progresses and can potentially have a lot of bad draws and lose games unable to cast a stabilizing card. I was planning on building a Jeskai control deck but as I started to build my mana base I realized that my Fumigate was VERY unlikely to get cast on turn 5. Just some helpful info for players and speculators cause I think (unfortunately too late) that Fast Lands will drop to the $2-3 range and the enemy color pairs might struggle outside of 2 color decks in Standard. were able to have out, experience the sun and summer we had by playing outside, lounging with the pool and bathing in those rays.